On 27th June 2018, a human rights lawyer, Prawet Prapanukul was found guilty of sedition and sentenced to 16 months’ imprisonment. Prawet, who has represented others accused of lèse-majesté (defamation against royalty), was arrested in May 2017 in connection with material he had posted on Facebook about Thailand’s 1932 revolution, which turned the country from an absolute monarchy into a constitutional one. During his arrest Prawet Prapanukul, was arbitrarily detained for five days at a detention facility inside a military base in Bangkok. He was charged with 10 counts of lèse-majesté and three counts of sedition. The court handed down a sentence of five months for each of the ten counts of sedition. It also sentenced him to an additional month in jail for refusing to fingerprint court documents. The additional sentencing was imposed after Prawet refused to cooperate with the authorities, saying that his trial was illegitimate. It later transpired that the lèse-majesté charges against him were mysteriously dropped without explanation. Given that he had already spent 14 months in jail at the time of sentencing, he was released on 25th August 2018. The military junta frequently brands people who express dissenting views against the authorities as a threat to national security. According to a report by Thai Lawyers for Human Rights in June 2018, 162 individuals were prosecuted for lèse-majesté (Article 116 of the Criminal Code) in the past four years, and another 92 were charged with sedition (Article 116 of the Criminal Code). On 16th August 2018, an appeal court handed down a four-month prison term, suspended for two years to three anti-coup activists - Piyarat Chongthep, Jirawat Ekakaranuwat and Songtham Kaewphanpruek. According to the prosecution, Piyarat tore up a ballot paper in August 2016, to protest against what he called an "undemocratic constitutional referendum" while the other two filmed the protest. A military-backed draft constitution, which many believed was undemocratic and enshrined military power, was put to a vote in August 2016. The junta banned criticism of the charter in the run-up to the vote and orchestrated a crackdown on dissent by arresting activists and media workers. Previously, in September 2017, the Phra Khanong Court had thrown out the charge of causing disorder against the three activists but found Piyarat guilty of damaging public property. He was originally sentenced to four months in prison and fined 4,000 baht (121 USD), but his prison term was substituted for a two months suspended sentence for one year and a reduced fine of 2,000 baht (60 USD) after he confessed. According to the Phra Khanong Court, the two others did not break any law when they filmed Piyarat. On 21st May 2018, three politicians were charged with sedition for holding a press conference, criticising the military junta. The politicians from the Pheu Thai party include Watana Muangsook, Chaturon Chaisang and Chusak Sirini. Five other party leaders were also charged with violating the ban on gatherings for attending. At the news conference, party members attacked the junta for failing to solve economic problems, violating human rights and failing to combat corruption and heal the country's deep political divide. The three politicians denied the charges after being interrogated by deputy national police chief Pol General Srivara Rangsibrahmanakul at the Crime Suppression Division. On 12th July 2018, a court dismissed charges against 14 migrant workers, from Myanmar, who alleged labour abuses in the country’s multimillion-dollar poultry export industry. The court found the workers had filed their complaint in good faith in order to protect their rights, as guaranteed by the Thai constitution and international conventions. In 2016, the migrant workers had filed a complaint against their former employer Thammakaset Farm 2, a poultry farm, which at the time supplied Thai food giant Betagro. The workers alleged that they had been forced to work 22-hour days without overtime and often slept in chicken sheds. They also said their passports had been confiscated and their freedom restricted. The owner of Thammakaset Farm 2 filed defamation charges against the workers, claiming their allegations were false and had damaged the farm’s reputation. The workers faced up to one year in prison and heavy fines if convicted. On 3rd September 2018, the Lop Buri Provincial Court dismissed another case filled by the company against two of the Myanmar migrant workers and a rights advocate, for stealing the company’s timecards off the premises without permission. The timecards had been presented to the Lop Buri labour inspector as evidence of alleged labour abuse. The court found that the workers had only taken the timecards to present as evidence, so their action did not fall into the criminal definition of theft. On 31st May 2018, a Thai appeals court dismissed a case against British labour rights activist. Andy Hall was sued by a fruit packaging company after he alleged human rights violations at their factory. His legal battle began in 2013 after he conducted research for a Finnish consumer organisation, Finnwatch, that alleged abuses against Myanmar workers at Natural Fruit’s pineapple canning operation. The workers claimed the company had broken labour regulations. After having his passport confiscated and being subject to a travel ban, Hall was found guilty of criminal defamation in 2016, fined and given a suspended prison sentence. The Appeals court accepted that Hall's interviews with migrant workers revealed allegations of rights violations that should be made public. The court ruling in 2018 dismissed the criminal defamation case, which also resulted in the collapse of a case under Thailand's computer crimes law which outlaws publishing what is deemed false information online. 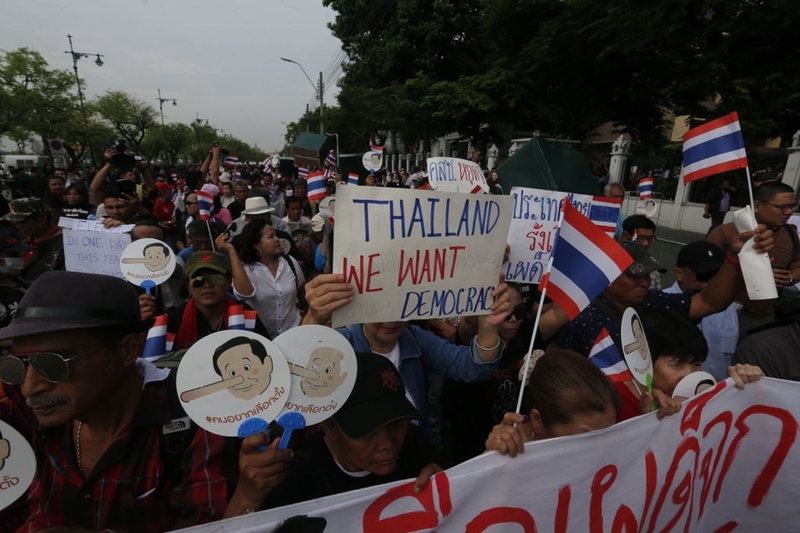 On 22nd May 2018, the fourth anniversary of the military coup in Thailand, hundreds of pro-democracy activists participated in a peaceful protest in Bangkok calling for an end to military rule. The protesters also called for elections to be held by November 2018, to fulfil commitments previously made by military government. 15 individuals were arrested on the day of the protest and subsequently charged with various offences including violations of Penal Code Sections 116 (sedition), 215 (assemblies leading to “breach of the peace”) and 216 (refusal to disperse). They are also facing charges under Article 12 of the NCPO Order No. 3/2558, which prohibits “political gatherings of five or more persons”, the Road Traffic Act, and the Public Assembly Act. On 24th May 2018, after being detained for two nights, the 15 activists were brought to the Bangkok Criminal Court and granted bail of 100,000 Thai Baht per person (approximately 3,100 USD). The court also imposed restrictions prohibiting the activists from organising or participating in further protests. On 29th May 2018, authorities issued summons to at least 47 additional individuals present during the protest, including a staff member from the local CSO, Thai Lawyers for Human Rights who was monitoring the event. On 7th June 2018, various charges were brought against the the 47 for their involvement in the protest including violating the NCPO No 3/2558 (ban on political gathering of five people), violating an official order to stop gathering and the Public Assembly Act and the Road Traffic Act. Six were additionally charged with sedition. On 5th July 2018, the authorities charged two academics and two students from Chiang Mai University, along with a writer, for ‘holding an unlawful political gathering’. At the 13th International Thai Studies Conference at Chiang Mai University in July 2017, members of the group held up a banner stating in Thai that “An academic seminar is not a military base,” alluding to the heavy-handed surveillance of the event by security forces in uniform and plainclothes. The group were photographed holding up the banner and making salutes based on the “Hunger Games” films. The Royal Thai Army raised a criminal complaint against them in August 2017. Those indicted by the Chiang Mai court are conference organiser Professor Chayan Vaddhanaphuti, sociology and anthropology doctoral candidate and lecturer Chaipong Samnieng, Masters student Teeramon Buangam, undergraduate student Nontawat Machai and freelance writer and translator Pakavadi Veerapaspong. The group have reported continuing ongoing surveillance and harassment over the past year. The five were prosecuted for violating Head of the NCPO Order No. 3/2015 which prohibits the gathering of five or more persons for political purposes, carrying a penalty of imprisonment not exceeding six months and/or a fine not exceeding 10,000 Baht (305 USD). According to the International Commission on Jurist (ICJ) at least 132 persons were reportedly charged under NCPO Order No. 3/2015 between January to June 2018. According to Thai Lawyers for Human Rights (TLHR), pro-election activist Ekachai Hongkangwan was physically assaulted by five unknown men on 22nd August 2018. The incident took place as he was arriving home after filing a complaint with the authorities demanding a probe into an alleged corruption case. Ekachai told TLHR that two men on a motorcycle followed him to his house after he got down from a bus. As he was approaching his house, the two men dismounted from the bike and physically assaulted him with their crash helmets. Shortly afterwards, another person emerged from hiding and joined in the attack, brandishing a wooden club. Ekachai subsequently managed to escape his attackers. As a prominent activist, Ekachai has faced various forms of harassment for his activism including being arbitrarily detained and ill-treated by the police and having his phone seized. On 1st August 2018, an ethnic Malay Muslim human rights activist was arrested and detained by the authorities. According to Human Rights Watch (HRW), authorities arrested and detained Burhan Buraheng of the human rights group Jaringan Mangsa Dari Undang-Undang Darurat (JASAD) under martial law provisions, and held him in a military camp without access to a lawyer. Thai security forces arrested Burhan at his house in Pattani province’s Sai Buri district. Soldiers initially detained him at the Sai Buri district police station before transferring him to Ingkayuth Boriharn military camp on the same day for further investigation under the 1914 Martial Law Act. Burhan and his family were not notified about the reason for his arrest. The Thai government’s use of the Martial Law Act in southern border provinces has long enabled the military to violate the basic rights of detainees. The law provides military authorities with legal immunity and broad powers to detain individuals without charge in informal places of detention for up to seven days. The provisions contain no effective judicial oversight or access to legal counsel and family members. Previously, the CIVICUS Monitor had documented the arrest of Aiman Hadeng, chair of the Justice for Peace Network and a prominent ethnic Malay Muslim human rights activist, from his house in Yala province’s Muang district during a security raid. Holding him under the 1914 Martial Law Act, the military prohibited Aiman from calling his lawyer, confiscated his mobile phone, and detained him at the 12th Task Force Camp. He was later transferred to the 41st Taharn Pran Paramilitary Division for further interrogation, allegedly for involvement in the separatist insurgency. He was reportedly released on 1st March 2018.